The Nitwits were a vocal group that began performing in Waterbury, Connecticut, in 1952. They were a trio consisting of Chic Hetti (born Carl Cicchetti) on piano and lead vocals, drummer and vocalist Donny Conn (born Donald Clapps), and Morey Carr (born Morey Cohen) on vocals and bass. All three were born in the Waterbury area. Each had attended the University of Connecticut in the early 50’s and decided to form a comedy group that also sang songs. They toured lounges in the USA and Canada. Their routine and material resembled another vocal group from the mid-50’s into the early 60’s named the Four Preps. Over five years of touring, the Nitwits shifted their focus from comedy skits with songs to being primarily a vocal group with comedic banter between tunes. In the spring of 1957, the Nitwits got a contract with Roulette Records, becoming the labels first vocal group. They changed their name from the Nitwits to the Playmates. In the middle of the calypso craze, they released an album titled Playmates Visit the West Indies. In 1958 they had a #4 novelty hit called “Beep, Beep”. The group appeared on the Milton Berle Show in December. The single was their third Top 30 record. Since the song mentioned the Nash Rambler in the lyrics, it created a bump in sales for that model. “Beep Beep” sold a million records and got The Playmates many invitations to tour around the USA and Canada. From 1958 to 1962 they charted ten songs on the Billboard Hot 100. The Playmates appeared on American Bandstand on May 24, 1958, and June 4, 1960. In the summer of 1959, the Playmates had another Top 30 hit titled “What Is Love?” The song’s answer was found in the lyrics: “five feet of heaven and a pony tail.” Their next four single releases got little attention, although “On The Beach” made the local Vancouver charts for a few weeks in the winter of 1959. After four commercial flops, The Playmates released “Wait For Me”. “Wait For Me” is a song written by Paul Vance (born Joseph Paul Florio) and Lee Pockriss. Together they wrote a number of hit songs including “Catch A Falling Star” (Perry Como – 1957), “Itsy Bitsy Teenie Weenie Yellow Polka Dot Bikini” (Brian Hyland – 1960), “Tracy” (the Cuff Links – 1969) and “Playground in My Mind” (Clint Holmes – 1972). Pockriss also wrote “Johnny Angel”, a hit for Shelley Fabares in 1962. “Itsy Bitsy Teenie Weekie Yellow Polka Dot Bikini” was actually inspired by Paul Vance’s shy 9-year old daughter, Paula, and an actual incident at a beach locker. Lee Pockriss went on to write the theme songs for the 1961 film One, Two, Three, the 1964 film The Subject Was Roses, and the 1966 film, Stagecoach. In later years Pockriss wrote a number of compositions for the TV series, Sesame Street. Vance and Pockriss also wrote a parody of the Shangri-Las’ 1964 #1 hit, “Leader Of The Pack”. Their Top 30 rejoinder was titled “Leader Of The Laundromat”, recorded by The Detergents. “Wait For Me” was the fifth of five singles to crack the Top 40 in the USA. In Vancouver, it peaked at #5. 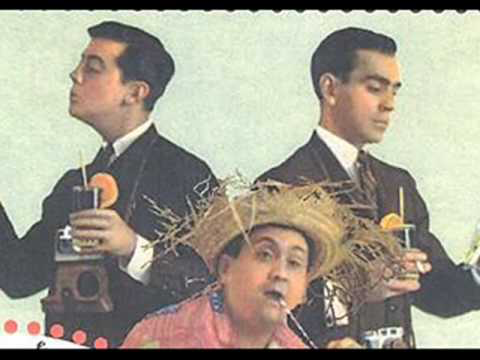 The song was similar to another hit back in 1958 called “Born Too Late” by the Poni-Tails. “Wait For Me” described a girl who loves Johnny from early childhood and asks the several years older Johnny to “wait for me.” Over the years Johnny is put off by her unwanted attention when he finds her waiting for him at the schoolyard gate. However, once he had grown up he finds himself in love with her “but it’s too late. She was married only yesterday.” Many Vancouver listeners found a song compelling, and a lesson about timing. “Wait For Me” had its highest chart run in Canada in Vancouver, where it uniquely made the Top Ten at #5. Although “Wait For Me” stalled at #37 on the Billboard Hot 100, it did well in a number of radio markets in the USA. These include climbing to the #2 position in Stockton (CA), #3 in Chicago, #4 in Akron (OH), #6 in Los Angeles, #7 in Corpus Christi (TX) and Fort Wayne (IN), and #9 in Minneapolis/St. Paul. After “Wait For Me,” The Playmates had another Top Ten hit in Vancouver titled “Little Miss Stuck-Up“, which peaked at #4. The single did poorly in the USA climbing to #70 on the Billboard Hot 100. Their next single release in the spring of 1961, written by Jeff Berry, was titled “Tell Me What She Said”. It was covered by Helen Shapiro who had a hit with “Tell Me What He Said” in 1962 in the UK and Vancouver. They also released a single of “Wimoweh” in the fall of 1961. The song was reworked with the title, “The Lion Sleeps Tonight”, and a #1 hit for The Tokens. A final Billboard Hot 100 single, “Keep Your Hands In Your Pockets”, stalled at #88 on the Billboard Hot 100 in the summer of 1962. But it made the Top 30 on CFUN in Vancouver. 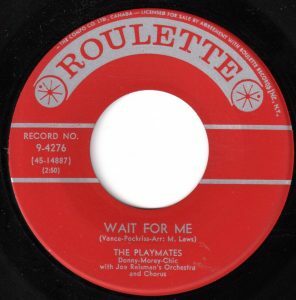 The Playmates left Roulette in 1963 and released three singles with ABC-Paramount. All were commercial failures. They went on to Colpix with no better success. They were one of countless American recording acts overwhelmed and sidelined by the Beatles and the British Invasion. The Playmates split up in 1965 after releasing 24 singles and five studio albums. In 2018, Chic Hetti is the only surviving member of the Playmates. Leslie Gray Streeter, ‘Its Bitsy’ Songwriter Paul Vance Looking for Another Hit at 85, Palm Beach Post, Palm Beach, Florida, January 24, 2015. Its Bitsy Bikini Songwriter Lee Pockriss Dies, BBC, November 18, 2011. Autos: Rambler in High Gear, Time, New York, December 8, 1958. Warner, Jay. American Singing Groups: a History From 1940 to Today. Hal Leonard Corporation, Milwaukee, WI, pp. 278-279.